While doing that I figured I could save on material and delivery fees if I finished the path running along the other side of the house. I have a path running from the driveway to the backyard gate where that path stops. I’d been wanting to finish that for some time, but just hadn’t gotten around to it. Starting this late January in central texas provide for some cool days perfect for working outside and since I was just getting acquainted with Mastachinism I was also attempting to get an early start at acclimating myself to the sweltering heat of summer thanks to the motivation provided by one of Mr. Money Mustaches posts. Okay enough babble here are the pics. 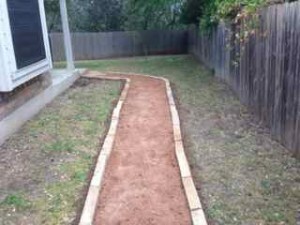 This is what the pathway looked like just after I removed the grass. I just eye-balled the line to make it striaght-ish. I figured it would be more important to ensure the bricks were laid straight, but since I wasn’t going to perfection a little crookedness was fine with me. 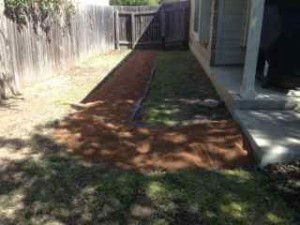 The next step and I wouldn’t recommend doing things in this order, was to add the decomposed granite. I didn’t have the brick but I had the granite and I was ready to go. So I put down some weed barrier and laid the granit down. I just left enough room on the side so it would be easy to pick up the weed barrier by the edge and move the granite to the middle when it was time to lay the bricks. Last step, bricks! It took me a couple of weeks to find the bricks I wanted, but since this was a personal project I was in no hurry. I used Daniel Stone and Landscaping Supplies. They’re fairly close to where I live so the delivery fee was cheap. One day I’ll have a truck again and I won’t have to worry about paying those fees. Just one last image of the finished project. In total this was no more that a 2 day job. I finished it in about a month taking my sweet time and just enjoying the work. My fiance was a huge help when it came to aligning the bricks. I’m not much for puzzles and that was probably the most challenging part of the whole project. 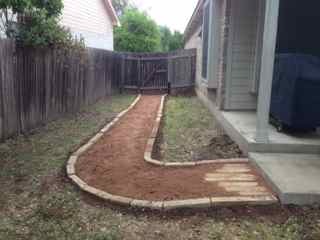 I don’t have an exact figure for the cost of this since I included stone and granite for the raised garden, but it amounted to about 2 yards of granite and about 3/4 ton of stone. For me the price for this material is less than $200. 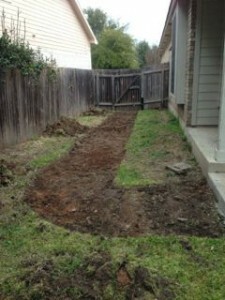 Way cheaper than a landscaper would charge for this. As another bonus on top of saving was getting outside and getting some exercise while increasing the value of my home. Winning!